The desk are actually two 200x90cm desks, further on the right is my gaming rig. The tables are connected with a few metal plates in the front to replace the two legs that would be in my way. My main workstation is an iMac Pro with maxed CPU and memory and two 5k LG Ultrafine. As input devices I got the MagicTrackpad, primarily for zooming and multi finger gestures, a trustworthy Cherry MX board 3 keyboard because my Corsair K70 still needs service. Both are with Cherry MX Red which are my preferred switches and a Logitech MX Ergo, which after 10 years feels so good to use one again. I went for a pretty large spec since it happens more often than I like to admit that I got an IDE for a web service, some auxiliary services, an IDE for a web app consuming the service and worst case XCode and Android Studio with simulators running. While there are arguments that this is too much stuff going on and that you should only need $x, the truth is that I simply sometimes have to debug things in a production-like environment across multiple platforms. And not having to free up resources on the server in my basement is lovely. On the left is my maxed out 2016 MacBook Pro with another Logitech MX Ergo. While I do not often work on code while traveling, it is more than sufficient to handle whatever service or app requires my attention. I usually go for top of the line and expect it to work at least three or four years, likely longer. This actually served me pretty well in the past. I do a lot of work on my 12.9″ iPad Pro with SmartKeyboard, which is so smart that it misses an escape key and forced me to learn ‘CTRL+c’ in vim, and an Apple Pencil. These days I do a shocking amount of work on this thing. Especially when working on specs or architecture documents being able to simply start drawing improved my workflow a lot. 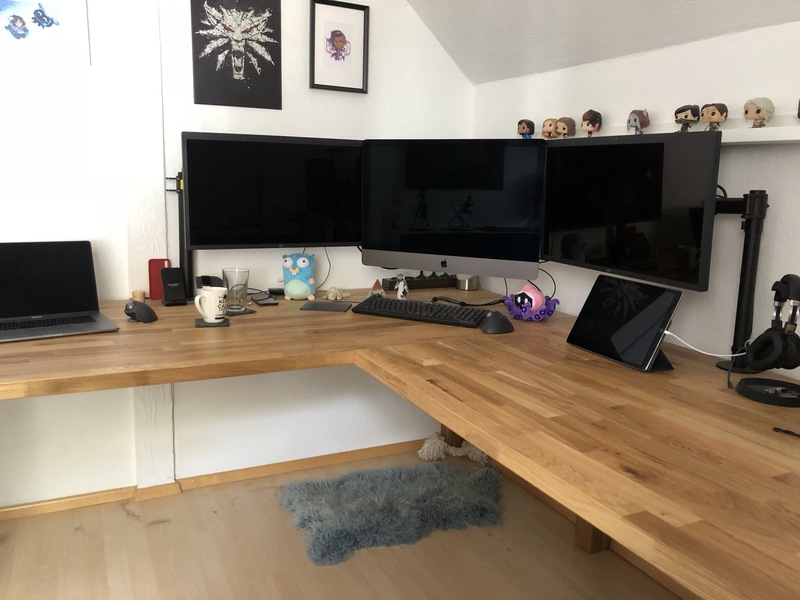 It is also used for most of my reading, research and video conferencing, since my iMac does not have enough resources for video conferencing in 2018 without turning up all fans into panic mode. The only other accessory, beside a bunch of test devices like an AppleWatch, Android phones,…, I use on a regular basis and love using is a Sennheiser PXC 550. It sounds good, can be paired to two devices, has proper noise cancellation for when I am forced to use a form of transportation that makes me sit beside lots of people I don’t know and is very pleasant to wear for a long time. In front of the fake fur for my dog to sleep on usually is a HermanMiller Mira 2. It took me some attempts to find a chair that works well for me, since 203cm height and >100kg is not something you can fit well on some random $100 Ikea chair. Believe me, I tried.